The Hotel Stromboli Roma offers 51 welcoming air-conditioned smoking and non-smoking rooms each elegantly decorated with comfort in mind. Our simplistic style ensures comfort and relaxation from the moment of arrival until your departure. Rome Hotel Stromboli caters to all types of guests including families as children under the age of 3 stay free of charge. Our rooms come in a variety of sizes to suit the requirements of any kind of group. Each of our modern sound-proof rooms is equipped with all comforts including private en-suites with shower or bath, hairdryer and shaving points. Af ter a long day relax with our Satellite TV service in a range of languages and channels with a cold drink from the fully stocked mini-bar. As well you can contact family and loved ones from the comfort of your own room with our direct dialling service. Safes are also available in every room to store your valuables and documents. Our reception is manned 24 hours a day by our friendly multi-lingual staff and we are pleased to offer advice and tourist information to help make your stay with us more enjoyable. Also on offer is a Bar with an intimate and welcoming atmosphere with an extensive cocktail menu or relax in our large hall equipped with Satellite TV. We also provide an internet point, fax, wake-up service, luggage storage, laundry service and parking on site. Don’t forget to take advantage of our year round special offers and excellent room rates when you book online using our secure real time booking system. Click here to find out how. 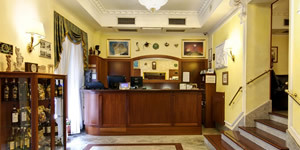 Please visit the Hotel Stromboli Roma Photo Gallery where you can take a more in-depth look at our rooms and the services we provide. Start off each morning with a fully buffet breakfast in our breakfast room or you may choose to have it served to you personally in your room. All rooms are serviced by elevators and for those with mobility problems disabled-access rooms.